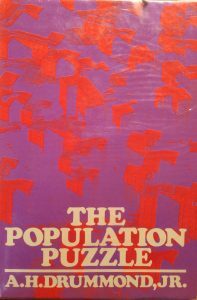 I forget exactly why I bought the book The Population Puzzle: Overcrowding and Stress Among Animals and Men by A. H. “Lee” Drummond, Jr., in October 2009, but buy it and read it I did. It will have been part of the endless maze of texts I have been through in my research for The Age of Pisces, but as for what exactly triggered my interest in the science of population and its growth at that time, I can’t say. What I can say is that more recently my interest was triggered again, this time by certain thoughts about the features of the Age of Pisces, the 2,200-year astrological age now drawing to a close. What are the dominant features of the current age–that is, the age that began about 2,000 years ago? A lot has happened in that time, but one of the most striking phenomena has been the growth of the human population. According to Wikipedia, the global population in AD 1 was around 200 million, or roughly the current population of Pakistan or Brazil. According to the U.S. Census Bureau, the world population in 2012 was about 7.06 billion–a 35-fold increase. If you look at a graph of world population growth over that period, you see a classic exponential or “hockey-stick” graph: the slope creeps upward imperceptibly for centuries, and then abruptly explodes. My eyes, looking at the little graph on the Wikipedia page, see that the point of explosion–technically when the slope of the curve goes past 1–is around AD 1800. At that time world population was still under 1 billion, but it has rocketed skyward since then. This phenomenon is actually consistent with the symbol of Pisces: the fish. From ancient times fish were noted for their enormous numbers of eggs and their ability to reproduce rapidly. The seas were conceived as teeming with infinite numbers of them. So an exploding human population is fishlike, is Piscean. What are the implications? What kind of world are we setting up for the transition to the next astrological age, the Age of Aquarius? I had started to type my highlights from The Population Puzzle; now I decided to finish that task, and indeed today I have finished it. What are my thoughts? Even in this short (135 pages) book aimed at adolescents, Drummond paints a picture of a fascinating and mysterious science. No doubt much has been learned since the time when he was writing (1973), but even at that time there had been many eye-opening studies and experiments. We talk about our “personal space,” and personal space is a real thing, not just for humans but for all animals. All animals have instinctive behaviors that are triggered when they are approached across the threshold of their personal space–and this threshold is not only different for all species of animals, but can change within the same species depending on external conditions. One interesting example is that lion tamers at the circus are able to move lions around by manipulating their personal space. Man, Homo sapiens, shares many of these traits with other animals, although not all of them. In the wild, most animal populations level off spontaneously, with the birth rate dropping and females becoming actually infertile as certain population densities are reached. Not so with humans, who show no signs of spontaneous reduction of birth rate due to increasing numbers. One of the most shocking experiments described in the book was one conducted on mice by the American researcher John Calhoun. He placed four pairs of mice in an 81-square-foot enclosure that contained an abundance of everything that mice need to live. The mice quickly multiplied until there were 150 of them, and they were all happy and well adjusted. But with no natural checks on their population growth–disease, predators, food shortage–they kept on reproducing until there were 2,200 of them. The population was no longer happy or well adjusted. Mice tend to form social groups of about 10 individuals. A pen this size allowed for 14 such groups–but no more. So 150 mice could live in normal social groups, but the remaining mice–2,000 of them–could not. This great majority of mice did not belong anywhere, and formed a massive lumpen proletariat. Unable to leave the pen and unable to gain entrance to one of the social groups, the excess mice withdrew into a huddled mass in the middle of the pen. After repeated rejections by the “organized” mice, these outsiders sharply reduced their movements—apparently to avoid being noticed. They simply huddled together or rested motionless alone. Within the huddled mass, however, there were frequent violent outbursts among the rejected mice. Moreover, because these mice were so withdrawn, they did not flee when attacked. Trembling violently, they remained in place and suffered severe bite wounds. The rejected mice learned to carry out only the simplest of behaviors, such as eating and drinking. They never learned to fight to achieve rank, or mate as normal mice do. Thus they were denied the activities of socially organized mice. They matured into passive blobs of living tissue, sleek and fat physically, but totally unable to take part in the normal activities of a mouse. This is a sobering image, isn’t it? These are mice, not men, but how much comfort can we afford to draw from that fact? Had Calhoun created a model of our own future? He himself was concerned about that. Indeed, observing the trend of human population growth, he estimated that we–humanity–were entering a 50-year DECIDE period: a period in which we collectively, as a species, would decide whether we are to die off, stagnate, or revive our species by bringing its numbers down harmoniously. Writing in about 1970, he saw the critical date as 2020: the date he labeled either DOOMSDAY or DAWNSDAY. Typing these notes today, I can’t help but reflect that 2019 is about to arrive, with 2020 hard on its heels. Since 1968 the world population has doubled. The graph of growth, whose slope is now near vertical, cannot go to infinity; it must crash somehow, and soon. But how? The astrological symbolism, by itself, cannot answer this. But it does include other interesting aspects, such as that Pisces rules the proletariat: those who have no special distinction beyond their head count. I venture to say that it rules the 2,000 mice in Calhoun’s pen who did not “belong,” even though they were in the vast majority. Is this a picture of our world–or the world to come–and what does it imply? I have no answer. But I feel that this book has come back into my hands at this time for a reason. Somehow, in ways that I myself do not understand, my writing is about all this. And I wanted to share that with you. Did you enjoy this post? Help me create more by becoming one of my Patreon patrons. If you’d like to support my work without spending money, I have just the page for you. This entry was posted in book reviews, thoughts, writer's notes and tagged A.H. Drummond, Age of Aquarius, doomsday, doomsday or dawnsday, global population, John Calhoun, overcrowding, personal space, Pisces, population, proletariat, reading, stress, The Age of Pisces, the astrological ages, The Population Puzzle, The Population Puzzle: Overcrowding and Stress Among Animals and Men by A. H. "Lee" Drummond, the world situation, U.S. Census Bureau. Bookmark the permalink.